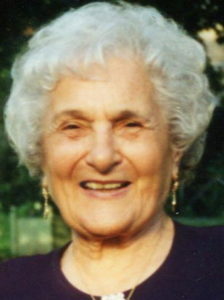 Vincennina (Vee) Currado, (nee Denino) 101, passed away on February 7, 2018 at Richmond University Medical Center from coronary heart failure. Vee was born in New York but moved to Staten Island shortly thereafter. She worked as a beautician before becoming a full-time mother and homemaker. She was devoted to her husband, Arthur of 75 years and her children, grandchildren and great-grandchildren. Her love for family extended to her siblings, nieces, nephews and cousins. Living in Port Richmond for most of her life, she enjoyed gardening and baking. Her flowers surrounded her house; she had multiple fruit trees and grew vegetables every summer. She especially loved to share her food and her flowers. Anyone who visited her, walked out of her house with either mint, tomatoes, flowers or cookies she had baked. It simply made her happy if she could give you something. She also enjoyed taking walks in Clove Lakes Park and traveling with her husband. She was predeceased by her husband, Arthur Currado; her sisters Rose Zancocchio and Catherine Curry, her brother, Carlo Denino and her daughter, Eileen Arnone. Vee is survived by her daughters, Maryann and son-in-law, Luddy Silvestri; Carol and son-in-law Theodore Moeller; son-in-law, Charles Arnone; her six grandchildren, Lynette Silvestri, Denine Kauffman, Kerri Bringslid, Charles Arnone, Theodore and Thomas Moeller and 14 great grandchildren. She is also survived by her devoted caregiver, Sophia Lyons. The funeral will be from Cherubini McInerney Funeral Home, 1289 Forest Avenue PR. On Monday at 9:15am with a funeral mass at St. Roch’s RC Church at 10am. Entombment to follow at Moravian Cemetery. Friends are invited to visit at the funeral home on Sunday from 2-4 & 7-9pm. Sincere sympathy to all. I remember running into Vee and Artie at Clove Lakes Park.. I admired them and I would say those walks helped both of them to live a long life. However it is never long enough when we lose our loved ones . I know she will be missed. They were beautiful people. Too all my friends in the Denino family I send my condolences on the passing of Vincenna . I could nt get there for the wake . May she rest in peace. My condolences and prayers . Are families have been connected for generations and every time one of our loved ones pass the memories of all those years come to the surface . God Bless you all. Al Lambert and the Lambert family .